Visionary iGaming Expands Its Live Casino Studio and Opens 10 New Private Blackjack Tables. 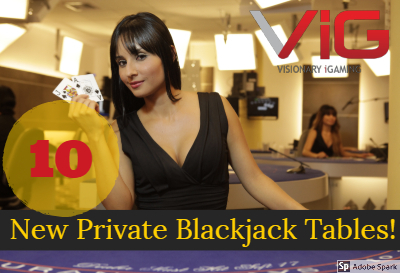 SAN JOSE, Costa Rica, June 13, 2018 – Visionary iGaming (www.visionaryigaming.com), one of the world’s leading providers of live online casino games, is delighted to announce that it will soon be opening 10 additional private Live Blackjack tables. To meet this demand, Visionary iGaming is expanding its state-of-the-art studio facility and hiring an additional 65 Live Dealers, bringing its San Jose-based staff to over 200. San Jose has proven to be an excellent city to service clients from and Visionary iGaming has been thrilled at the high quality talent available in the metropolitan area. Visionary iGaming is a B2B Live Dealer Solutions provider, specializing in creating the highest quality and most interactive Live Casino experiences available online. The company’s games include Live European Roulette, Live American Roulette, Live Blackjack, Live Baccarat, Live Super 6, and Live Blackjack Early Payout. For further information about the company or to request an interview, info@visionaryigaming.com.